StyleMePretty661: Spring Break Picks / Family Vacay Plans! Spring Break is always something to get excited about. Just the sheer mention of it makes you grin, right? For me, it means lounging pool- or beach-side soaking up the warm rays of the sun, watching my little ones splash around and play in the kiddie pool or sand, endless BBQs/good eats with family and friends, and, of course, my favorite colorful dresses, swimsuits, and resort-wear on repeat. This year, I'm especially excited -- nearly giddy -- as I prepare and pack for our first family getaway that's approaching in just a few short weeks (eek!) You have to understand, the last time I flew anywhere for an extended vacation was with my husband nearly 7 year ago, well before we had kids and when we had more disposable income for leisurely travel. ;-) So, for our 12-year wedding anniversary this month, my husband and I decided we would venture to a gorgeous, tropical location with the kids and enjoy a combination of fun, family-friendly activities, plus get a nice respite from the everyday hustle n' bustle. 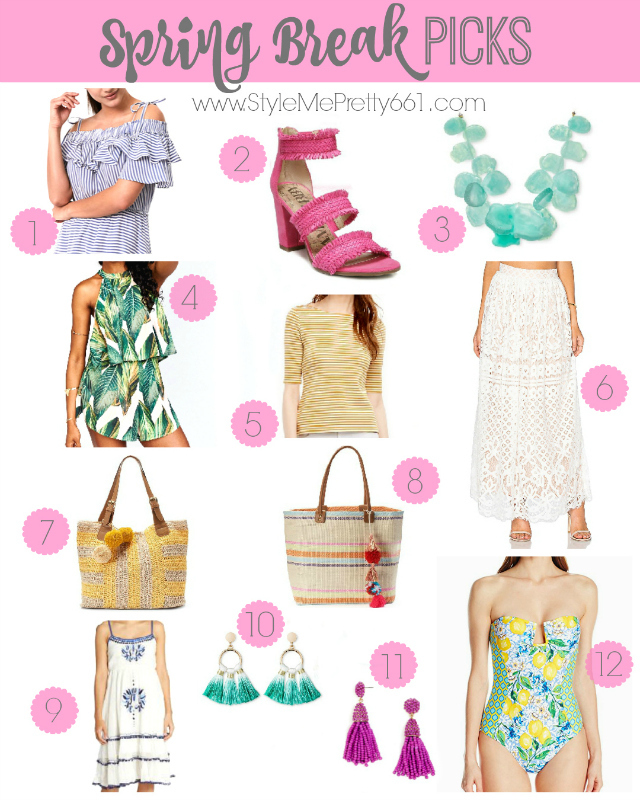 I'm still in the process of getting my packing under control, aka narrowing down my picks after outfit planning (I'm trying to break the habit of over-packing), but I wanted to share some of my top Spring Break picks with you, along with some new pieces I've already ordered, so that if you're also planning any upcoming vacations, trips or even some fun "stay-cations," you'll have a few ideas of what to bring along. For starters, most of the items shown in the collage above, or close variations if the items are older, are coming along with me because I'm loving them! You'll quickly notice a theme of fun, vibrant colors juxtaposed with light and airy neutrals and crisp whites. That's because these pieces all scream "vacation" to me, and can be mixed and matched to create multiple outfits without too much thought. And when you're on vacation, you want to keep it simple. So, I'm breaking up my picks by category. You can't have Spring Break without at least one amazing swimsuit! Everyone needs a cute swimsuit that makes them feel and look great! My current favorite is this pretty "limoncello" print one-piece (#11 in the photo) that I gushed over in this previous blog post. I took a chance ordering it online without trying it on, so I was a bit apprehensive about the fit. But I'm happy to report that it fits perfectly! Most swimsuits tend to run on the small side, so the size 4 I ordered, which is the smallest size available for this brand, fits like a true XS. It's fun, flirty, and still provides modest coverage. This is a great swimsuit if you're petite like me because the torso isn't too long. I also like that it's a convertible style, so you can either wear it with the halter strap or wear it strapless to avoid those pesky tan lines. I adore the fresh, colorful print and think it's perfect for Spring! I had a hard time choosing a swimsuit cover-up; there are so many darling ones available right now! I didn't want to spend too much money on one, so I perused several options online and thanks to fellow blogger, Courtnee, I snagged this one that doubles as a sundress. It has a detachable lining, so you can remove it and wear the shell as a cover-up and then re-add it when you want to wear it as a dress. Yay for versatility! And it's a total steal for $30! Since a 20% off promo was running at the time I ordered it, I ended up scoring it for even less -- $24 plus free shipping! You can't beat that! It's really adorable and will easily transition from a day at the beach/pool to dinner. A fun and functional beach tote is also a must for any vacation. With a wide array of fun straw and other woven varieties, I opted for both a neutral one as well as a colorful one. I ordered this neutral market bag, which is a slightly dressier tote that will work well for the beach as well as for weekend errands, lunch dates, or other everyday Spring/Summer outings post-vacation. The colorful tote I ordered is this yellow-striped one with pom poms (#7 in the photo) -- so cute! It's a great, affordable dupe to the ever-popular (and pricey) Mar y sol bags, and it's less than $50! It comes in a pink-striped option and a navy-striped option, too. I love all 3 colors, but ultimately decided on the yellow. I can't speak to the quality of either bags yet since they haven't arrived in the mail, but I'm hoping both are keepers! The rainbow-striped tote (#8 in the photo) was a close contender, too; the colors and pom poms are so fun! And, even though it's less practical (and not even a tote for that matter) and definitely on the pricey side, this pink-striped pineapple clutch stole my heart! Isn't it charming? Since sandals, especially wedges, are the unofficial mascots of Spring and Summer, they're another vacation must-have. I may pack 1 - 2 basic, lightweight camis or tanks for layering as well; they're good foundation pieces and don't take up much space. In keeping with the same "beach vacay" theme, I'm choosing pieces that are both fun and colorful, intermixed with a few dainty, gold layering pieces. This aqua seaglass necklace (#3 in the photo) by Sugarfix (Sugarfix is Baublebar's design collaboration with Target stores) is definitely coming along with me. Isn't the color beautiful? It's the perfect color match for the aqua-blue waters I'm so eagerly awaiting. Plus, it's only $16 -- a fraction of the price of the original Baublebar seaglass necklace ($68!) The Sugarfix option also appears to be smaller and less chunky, which I actually prefer since the original looks like it might be too overwhelming on me. I'm also bringing these aqua tassel earrings and these orchid tassel earrings (#s 10 & 11 in the photo.) Since my day-to-day jewelry is usually more classic, it's nice to change it up a little for Spring Break, and these bright and colorful pieces are a great way to do just that. They'll also really pop against the white eyelet dress and white lace top I'm bringing, too, which is one of the ways I plan on styling them. The dainty pieces I'm bringing include my favorite Kendra Scott Elisa Necklace in the ivory/mother-of-pearl color, a pair of gold stud earrings, and the gold bangles gifted to me by my in-laws that I pretty much wear daily. This layered necklace is catching my eye, too! To round out the accessories, I will also bring a lightweight scarf or two; they come in handy on the plane when it gets chilly and they can also do double-duty as a wrap or cover-up on the beach. Since the resort will be providing towel service (no laundry for this momma -- yesss! ), I really don't need to pack any towels, but I decided to bring this circle one just for good measure. I'm also eyeing this one and this one for Summer -- palm prints and stripes? Yes, please! Phew, I think that's everything for now! I may make a few tweaks along the way, but this is my "outline" that I'm really trying to stick to. I can't wait until we're on the plane and in the clouds heading to our tropical oasis. This will be the kids' first time on an airplane, too, so they're super excited and keep asking me, "are we going on the air-pwane yet, Momma?" 20 times a day. (lol) Hopefully, everything will go smoothly and they'll love the adventure of it all! I hope you find these Spring Break picks helpful and I hope that you get to enjoy some sunny, gorgeous weather of your own soon! If any of you have already traveled to Cancún and have any recommendations on what to do/see, I'd love to hear them! We're already trying to plan a trip to this cenote as well as the Xplore Park (we've always wanted to try zip-lining!) We'll probably make some stops along the way to Playa Del Carmen and Tulum, too. A visit to the amazing Mayan Ruins, including the popular Chichen Itza, is also on the agenda. Eeek! Did I tell you I'm excited? Happy Friday, loves, and thanks so much for stopping by!